The subiculum is a pivotal but under-investigated structure positioned between the hippocampus proper and entorhinal and other cortices, as well as a range of subcortical structures. The subiculum has a range of electrophysiological and functional properties which are quite distinct from its input areas; given the widespread set of cortical and subcortical areas with which it interacts, it is able to influence activity in quite disparate brain regions. The rules governing plasticity of synaptic transmission in the hippocampal-subicular axis are poorly understood; this axis appears to share some properties in common with the hippocampus proper, but behaves quite differently in other respects. Equally, its functional properties are not well understood; it plays an important but ill-defined role in spatial navigation, mnemonic processing and control of the response to stress. Here, I review investigations of synaptic plasticity in the hippocampal-subicular pathway, recordings of subicular neurons in the freely moving behaving animal, the effects of behavioural and other stressors on subicular synaptic plasticity, and anatomical data on the dorso-ventral organization of the subiculum in relation to the hypothalamic-pituitary-adrenal (HPA) axis. I argue that there is a dorso-ventral segregation of function within the subiculum: the dorsal component appears principally concerned with the processing of information about space, movement and memory, whereas the ventral component appears to play a major regulatory role in the inhibition of the HPA axis. 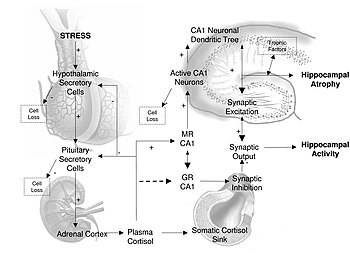 UPDATE: The figure above originally derives ‘A mathematical model of aging-related and cortisol induced hippocampal dysfunction’ by Mark T McAuley, Rose Anne Kenny, Thomas BL Kirkwood, Darren J Wilkinson, Janette JL Jones and Veronica M Miller. See Veronica Miller’s lab details. The subiculum: a review of form, physiology and function.